Finding great music on the internet is easy, but keeping all of it organized can be tough. You might have videos favorited at YouTube, a playlist at SoundCloud, or maybe artists bookmarked at Bandcamp. Songdrop collects and organizes them all for you. 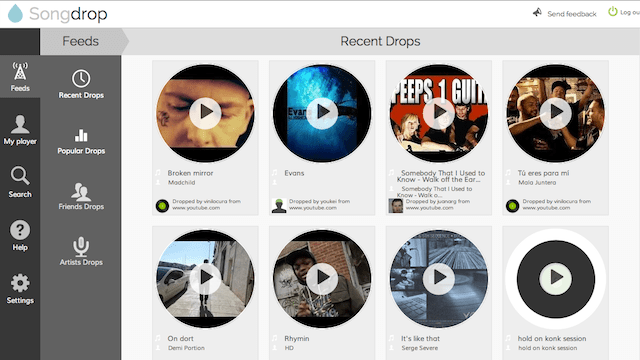 Songdrop is often referred to as a Delicious for music, and that analogy isn’t too far off. Create a free account (or sign up via Facebook if you choose) and drag the bookmarklet to your browser toolbar. From there, just click the bookmarklet to add any music you find and enjoy at YouTube, SoundCloud, Bandcamp, Tumblr, VEVO, or other music blogs right to your Songdrop collection, much like bookmarks. As always, you can use one of our amazing android tablets or smartphones to access this interesting web based storage for your favorite music.